Maybe it's the fanboy in me, but I'm utterly fascinated when a comic reader discovers a new character they were previously unaware of and really dives deep into the character's bibliography. I always enjoy hearing other people's perspectives on characters/titles/story lines and why they enjoyed them so much. When I first heard the name 'Plastic Man' I assumed he was one of those overly campy superheroes from an outmoded print era. Over time, having heard a little more about him, I thought Plastic Man was nothing more than a jokester who was only ever written in team books as an easy way to inject comic relief. My overall initial impression of the character was that he was just some clown pulled from the Golden Age and shoved into modern books as a way to keep a legacy character relevant. 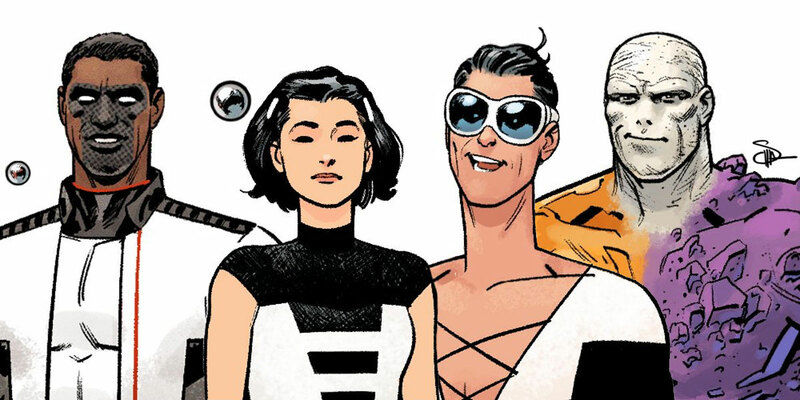 I don’t think I’ve ever been so wrong when judging a character as I was when I judged Plastic Man. What instantly changed my perception of the character was when I heard about his origin story. Plastic Man is your typical crime-fighting superhero with an atypical beginning. 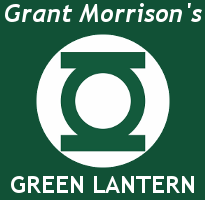 He was created by cartoonist Jack Cole and first appeared in 1941's Police Comics published by Quality Comics. What was so different about this superhero’s origin was that his real identity was a gangster. This character, who is predominantly known now for his physically comedy and joke telling, was a career criminal before he became a superhero. Before becoming Plastic Man he was known as “Eel” O’Brian, a name he earned by being too “slippery” to be caught by police. O’Brian’s specialty was safe-cracking. It was busting a safe to steal a chemical plant’s payroll that lead to O’Brian’s transformation from criminal to superhero. During the caper O’Brian ended up being shot through shoulder by a security guard and doused in experimental chemicals. Ditched by his cohorts, O’Brian managed to stumble away out of town before passing out. He woke up in a mountain retreat where he had his wound tended to by a monk. The monk revealed to O’Brian that he turned away police who had tracked him to the area because he believed that O’Brian was “a man who could become a valuable citizen if he only had the chance”. O’Brian, taken aback by the monk’s kindness, had his faith in humanity rekindled and he began to regret his life of organized crime. While recovering, O’Brian discovered that he has acquired the ability to stretch and contort his body as a result of the acid which fell into his gunshot wound. Inspired by the monk, O’Brian resolved to end his career as a criminal and take it upon himself to put away people like his past gang members who had left him for dead in the chemical plant. Plastic Man initially fights crime by infiltrating gangs with the aid of his alter ego’s connections and eventually begins formally working with FBI to help stop crime. Plastic Man also has an ex-thief of a sidekick named Woozy Winks who Plas helped go straight. Woozy is a hilarious character who helps give Plastic Man his unique brand of humour. 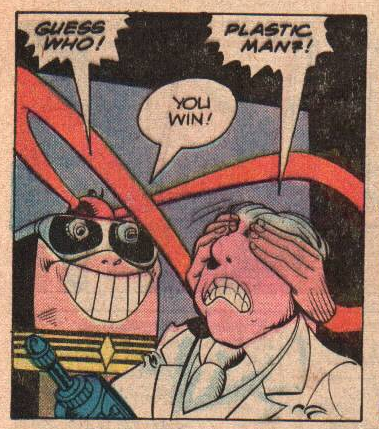 panel from Plastic Man #17 (1976). Art by Ramona Fradon. While Plastic Man’s origin has its cheesy streak (i.e. monks being the ones who set O’Brian on the right path despite the story taking place in an urban setting), I insist that the core of the character is very relatable and remains relatable to the modern reader. He is someone who had done wrong in the past, is given the opportunity to do good, and uses that opportunity to make amends and become a better person. He forever has insecurities about his past wrongdoings and a fear of being rejected if anyone where to find out about his past. Plastic Man, for these reasons, is a flawed and developed character who leaves me with an optimistic outlook. His story tells us that there can be good found in people and that sometimes they just need the chance to show it. panel from Police Comics #19 (1943). Art by Jack Cole. -Later Plastic Man was given his own book, Plastic Man (1943). As it goes with any old character, they see change over the years through being passed on from writer to writer. Sometimes the soul of the original character gets lost in narrative changes and continuity shifts. The DC series and appearances I’ve chosen for this list are ones that I think stay true to the spirit of Jack Cole’s original work. 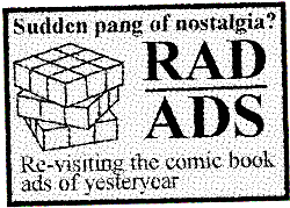 panel from Adventure Comics #469 (1980). Art by Joe Staton. If you’re a fan of light-hearted crime stories or satirical comics then I think you’ll find the comics listed above quite enjoyable. Thank you so much for reading and I hope you’ve discovered a new character to love.